Here is a list of best free Software Deployment Tool for Windows. These software can be helpful when you have to install a software without physically accessing a computer. You can deploy software on single or multiple computers at once using these software. These computers can be located on a remote network or on local network. Some of these also let you deploy multiple software on remote computers easily. You can create various packages of multiple software, and deploy them. You can easily deploy and install MSI and EXE files with these remote software installers. The functionality of these software is not limited to just installing software remotely. You can also use these tools to update or uninstall software on remote computers. You can maintain an inventory of software using some of these, making the software deployment even more swift. In the following list, you will find dedicated software deployment tool, as well as desktop manager software that let you install software remotely. I like PDQ Deploy the most. It is a dedicated remote software installation tool and supports unlimited number of computers for software deployment. It supports both MSI and EXE formats for installation. You can also take out reports based on deployments and software packages. It provides various other features that you will like. Continue reading to know more about PDQ Deploy and other software installer tools in brief. PDQ Deploy is a dedicated and free software deployment tool. The free mode of PDQ Deploy lets you deploy software on single as well as multiple computers. It lets you create software installation packages. These packages are then deployed to remote computers for software installation. It supports BAT, EXE, CMD, and MSI files for installation. To begin with, you will have to create installation package by adding package description, installation file, installation parameters, etc. You can also set installation conditions, but it is only available for the Pro mode. All the added packages are saved and can be viewed in Package Library. After successfully creating package, it can be deployed easily. You can either deploy it to a single computer or multiple computers. Connection to remote computer is established via IP address. To deploy software to multiple computers, you will have to create a Target list, then send package. If deployment fails on certain computers, an option to redeploy to failed targets is available. The Report section lets you extract several reports related to Deployment and Packages. PDQ Deploy provides various other features, such as nested multi-step package installation, deployment status email, auto deployment, package sharing, etc. These features are available for the Pro and Enterprise versions of PDQ Deploy. 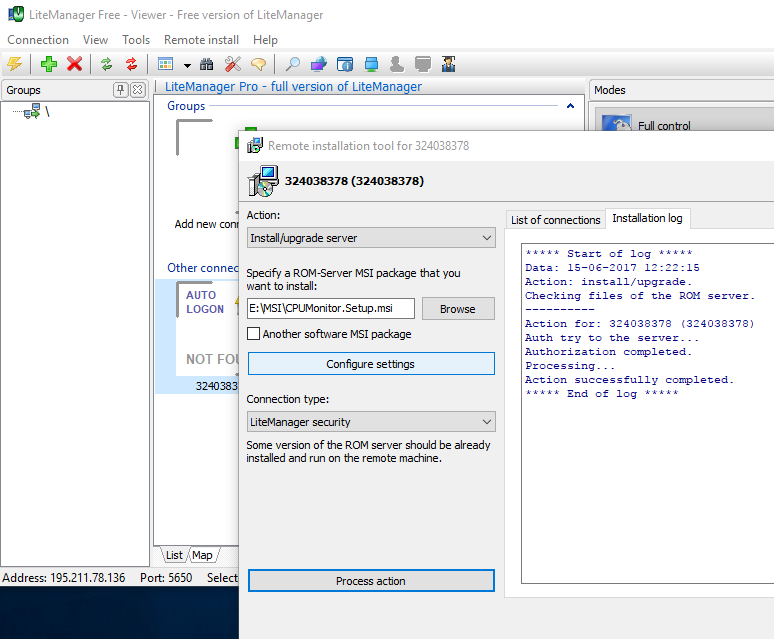 LiteManager is a free software deployment tool for Windows. It is basically a remote desktop manager software that lets you manage multiple computers remotely. You can use this software to deploy software on multiple computers at once. Simply select the installation file for installation, select the computers on which you want it installed, and the installation will be done remotely. Limitations: You can only install MSI packages using this software. The free version of LiteManager only lets you manage a maximum of 30 computers. To deploy software, you first need to connect the Viewer computer to Remote computers. You can establish connections either by using remote computers’ IP, DNS, or connection code. Once the connection is established, go to the Remote Install option on the viewer PC. This opens the Remote Installation window. Here, you can select the MSI package to be installed, select multiple remote computers, and begin installation. It is as simple as that. The selected Microsoft Installer file will remotely install software on all PCs simultaneously. To install more software, select the other MSI file and repeat the process. LiteManager is an amazing desktop manager with remote software deployment tool. You can also fully control computer, transfer files, shutdown computer, execute a command, chat, and do much more with this free software. Free version of LiteManager is absolutely free to use and has no functional limitations apart from the restricted number of manageable devices. Remote Utilities is another good desktop manager with remote software deployment tool. 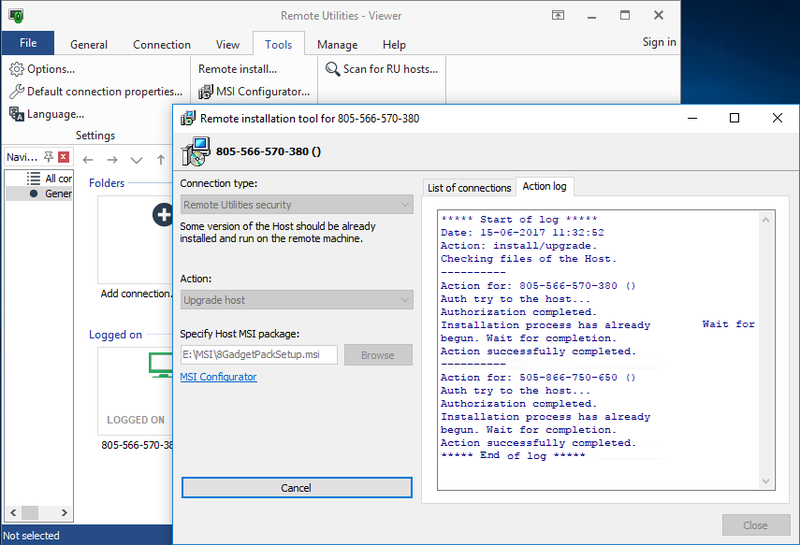 Its remote installer tool is exactly the same as LiteManager. It lets you install MSI files on multiple desktops at a time. The difference between these two software is the availability of some extra desktop management tools in Remote Utilities. Do note that you can only deploy MSI files using this software deployment tool. Also, you can only add and deploy software to upto 10 remote computers with the free version of Remote Utilities. The restriction is only on the number of remote computers, and not on the functionalities of this software. The software needs to be installed on both viewer and remote PCs, just like LiteManager. Once the connection is established, you can begin software deployment. Software deployment is very easy with this software. Go to the Tools menu and select the Remote Installation tool. Here, you will view all the available computer connections, browser option to select MSI file, and MSI configuration settings. Before software deployment, you can configure MSI installer to install standard MSI package, One-Click package, or Agent MSI package. Select the remote computers on which you want to deploy software, select the MSI file to be deployed, and process the action. The selected file will be installed. Repeat the same process to install another MSI file. Remote Utilities lets you manage multiple computers for free. You can fully control PCs remotely, monitor PCs, record screen, transfer files, video chat with remote users, and do much more. Desktop Central is an enterprise level desktop and mobile device manager software. It lets you manage remote computers and has software deployment tool as well. It’s a cross platform software and runs on Windows, Linux, Mac, iOS, and Android. You can deploy both EXE and MSI software. 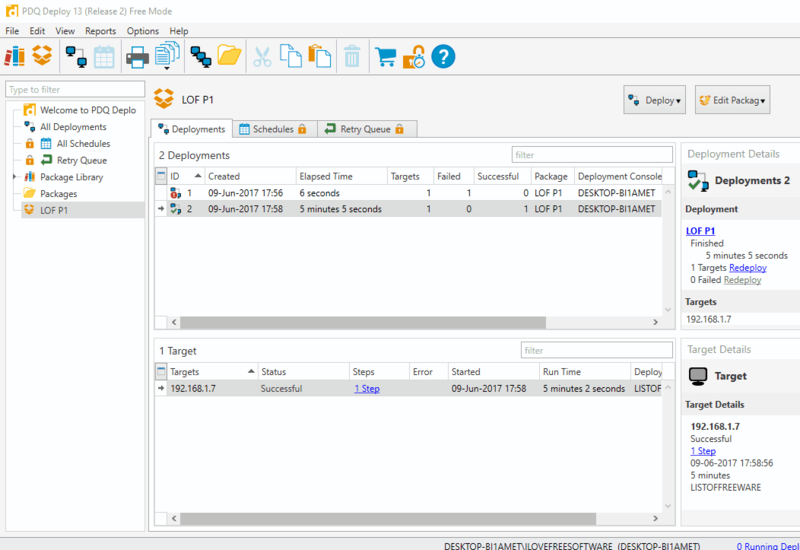 Perform pre-deployment activities on remote computers. This ensures if a system is ready for software deployment. Perform status check on software installation. Create software repositories with EXE and MSI software. Uninstall EXE and MSI software on remote computers. These features will help you with seamless installation of software on multiple computers while saving a good amount of time. There are various other features of Desktop Central that make it one of the best device manager software. It provides Patch Management, Mobile Device Management, IT asset management, USB device management, and other features that are must for organizations. Desktop Central’s free version only supports up to 25 PCs, but there is no limitation on the features it provides. FusionInventory is an open source inventory management software with software deployment tool. It is multiplatform and works with Windows, Linux, BSD, Mac, and more. The software deployment tool can install software on multiple remote PCs at once. You can either enter a range of IP address to deploy software, or simply browse network to select computers for installation. Select an EXE file for setup, then select plugin(s) or extra file(s) to be copied to host while deployment. You may have to enter remote computer’s login and password credentials, or SSH key. FusionInventory is an extensive tool and is mostly used by IT department of organizations to manage large number of computers. It also supports Wake-on-lan, making this software pretty useful. To know more about FusionInventory and how to setup, visit its documentation page. EMCO Remote Installer is another good remote software installer software for Windows. Deploy single or multiple software on computers using this software deployment tool. You can deploy packages on single or a group of computers remotely. There are various other features of this software that you will like, but the free version is bound with certain limitations. One of the limitations is that the free version only supports upto 5 PCs for remote software deployment. Also, multi package deployment is limited upto 5 software packages per deployment. You can deploy MSI, EXE, MSP, BAT, and CMD packages with this remote installer software. Uninstallation of software can also be carried out. You can create bundles of multiple software and deploy them for multiple installation. You can add software in the software inventory, then look for a software and deploy it easily whenever required. To deploy software, you can look for computers individually, add computers by adding an IP range, or scan local network for computers and add them. 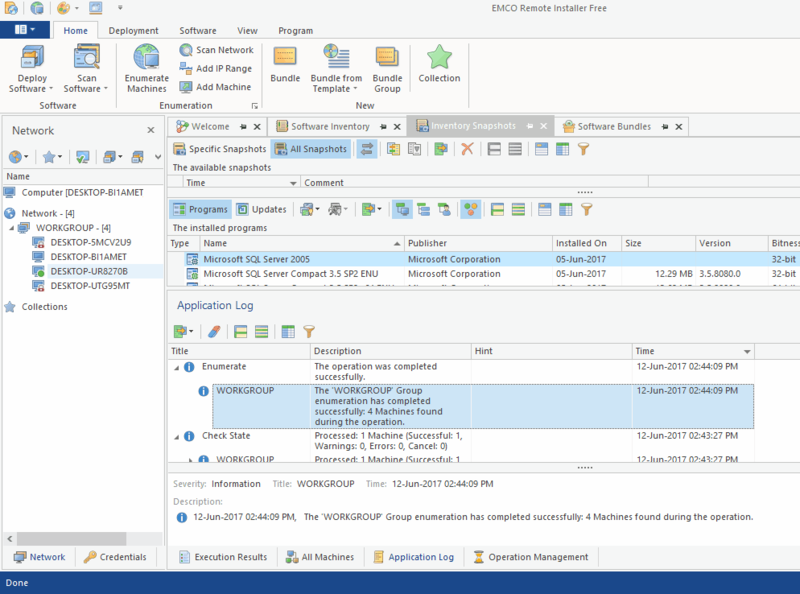 EMCO Remote Installer may be an advanced software deployment tool, but the limitations make it practically unusable even in a small sized organization. If you like the free features and would like to explore more, then upgrading to the Pro version is suggested. Checkout this Comparison list to view features available in free and professional editions.